Miami Trace senior Cassidy Lovett, left, is guarded by Fairfield Union junior Evie Wolshire during a non-conference game in the Panther Pit at Miami Trace High School Tuesday, Nov. 27, 2018. Back on Feb. 8 of this year, the Miami Trace Lady Panthers played what at the time was marked as the final girls’ basketball game in the Panther Pit. That game happened to be a 72-41 victory over the Lady Falcons of Fairfield Union High School. 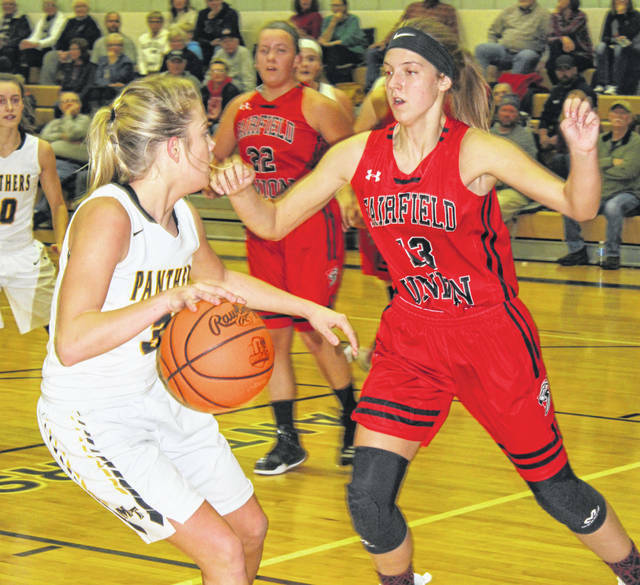 Tuesday night, the Lady Panthers had their 2018-19 season home-opener, in the Panther Pit, against none other than Fairfield Union. Miami Trace bounced back from a season-opening loss at Lynchburg-Clay on Saturday night to post a 48-38 victory. Miami Trace Athletic Director, Aaron Hammond, handling the public address duties for the game, told the crowd that he promised this would be the final season of games in the Panther Pit. The friendly confines of the 56-year-old gymnasium, unique to this area, served its designated purpose well once again and will continue to do so until the new high school is ready to open. In the meantime, it was a tenacious Miami Trace team that got after things against the Falcons Tuesday night. Junior Shay McDonald was the game’s leading scorer for Miami Trace with 19 points. Senior Olivia Wolffe scored nine points, including hitting two three-point field goals. Senior Cassidy Lovett and sophomore Delaney Eakins each scored seven points for the Lady Panthers. Junior Katie Burke led Fairfield Union with 10 points. Senior Hannah Burnside and junior Evie Wolshire each chipped in seven points. Wolshire also had several blocked shots in the contest. The game was tied four times in the first quarter. After eight minutes of play, the game was knotted, 8-8. Miami Trace in essence won the game with a 15-2 second quarter to take a 23-10 lead into the locker room. The second half was much closer as the Falcons outscored Miami Trace by two points in the third quarter and one in the final eight minutes to put the final tally at 48-38. Miami Trace led four times by 13 points in the second half. Fairfield Union never gave up and cut the lead to six points with 45 seconds remaining. Miami Trace made 5 of 6 free throws in the waning moments to keep Fairfield Union at bay. “Fairfield Union is a much-improved club,” Miami Trace head coach Ben Ackley said. “I thought they did a lot of things right. Their length gave us some issues at times. Ackley lauded the efforts of Shay McDonald. “Shay carried us in the first half,” Ackley said. “She absolutely put us on her back. Miami Trace will travel to Chillicothe Saturday for a Frontier Athletic Conference game against the Lady Cavaliers. The j-v game is slated to start at 5:30 p.m.
Chillicothe lost Tuesday night to Logan Elm, 41-26. Also Tuesday night, Unioto crushed Zane Trace, 77-18 and Southeastern defeated Adena, 48-28. MIAMI TRACE — Olivia Wolffe 1 (2)-1-9; Cassidy Lovett 2-3-7; Becca Ratliff 1-0-2; Aubrey McCoy 1-0-2; Shay McDonald 8-3-19; Tori Evans Aubrey Schwartz 0-0-0; Gracee Stewart 1-0-2; Delaney Eakins 0 (1)-4-7. TOTALS — 14 (3)-11-48. Free throw shooting: 11 of 16 for 69 percent. Three-point field goals: Wolffe, 2; Eakins. Field goal shooting: 17 of 48 for 35 percent. Three-point field goal shooting: 3 of 9 for 33 percent. Rebounds: 33 (9 offensive). Turnovers: 15. Assists: 8. Steals: 11. FAIRFIELD UNION — Braidyn Reed 1-0-2; Hannah Burnside 2-3-7; Olivia Spillers 0-0-0; Evie Wolshire 2 (1)-0-7; Ava Moellendick 3-0-6; Hannah Rauch 0-0-0; Katie Burke 5-0-10; Marisa Malone 2-0-4; Claire Cooperider 0-2-2. TOTALS — 15 (1)-5-38. Free throw shooting: 5 of 9 for 56 percent. Three-point field goal: Wolshire. Field goal shooting: 16 of 46 for 35 percent. Three-point field goal shooting: 1 of 7 for 14 percent. Turnovers: 17. Offensive rebounds: 7. In the junior-varsity game Tuesday, Fairfield Union defeated Miami Trace, 27-14. Miami Trace (1-1 overall) was led by Magarah Bloom with five points. She had one three-point field goal. Anna Hartman led Fairfield Union with a game-high 10 points. MIAMI TRACE — Reagan Barton 1-1-3; Emma Pitstick 1-0-2; Sidney Payton 1-0-2; Mallory Pavey 0-0-0; Addy Little 0-0-0; Lilly Workman 0-0-0; Aubrey Wood 1-0-2; Magarah Bloom 1 (1)-0-5. TOTALS — 5 (1)-1-14. Free throw shooting: 1 of 7 for 14 percent. Three-point field goal: Bloom. Field goal shooting: 6 of 32 for 19 percent. Three-point field goal shooting: 1 of 2 for 50 percent. Turnovers: 14. Rebounds: 20 (8 offensive). Assists: 2. Steals: 8. FAIRFIELD UNION — Brooke Holt 0-0-0; Alexis Cymanski 0-0-0; Brenna Reed 2-2-6; Gabby Greenman 1-0-2; Brittany Devall 2-0-4; Addie Sharp 0-0-0; Tatum Campbell 2-1-5; Anna Hartman 5-0-10. TOTALS — 12-3-27. Free throw shooting: 3 of 7 for 43 percent. Three-point field goals: none. Field goal shooting: 12 of 30 for 40 percent. Three-point field goal shooting: 0 of 1. Turnovers: 17. Offensive rebounds: 11.